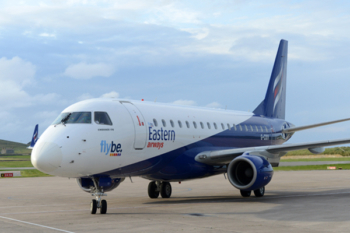 Flybe, via its franchise partner Eastern Airways, has announced a new route from Newcastle to London City Airport. Starting on 7th January, flights will leave Newcastle at 08.05 and 17.50, with return services from London City at 09.45 and 19.30. There is no service on a Saturday and a single evening service on a Sunday. You can earn Avios on these services at the standard Flybe rates. I am not sure if, due to the franchise nature of this route, it will be available as a redemption – nothing is showing at the moment. Flights can be booked at flybe.com. 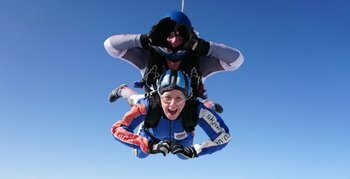 Do a tandem skydive with Hilton! If you have been thinking that the current options of spending your miles and points are a bit, well, dull, Hilton Honors has the answer. Get ready for the ultimate adrenaline rush as you jump from 15,000 feet – the highest you can skydive from in the UK. After 20 minutes instruction, you are ready for the rush of freefall and a 5 minute canopy ride. Tandem skydiving allows you to experience the thrill of freefall skydiving without any extensive training as you will be accompanied by an experienced instructor who will also be your own personal cameraman to film and photograph your experience. There are no bids so far! The minimum acceptable bid is just 45,000 Hilton Honors points. Place your bid here. The hotel website is here. IHG Rewards Club is, until 31st December, running a promotion offering double base points on every stay, starting with your second stay. Our article on the IHG double points offer is here (ignore the closing date which has now been extended to 31st December) and you can register here. The registration page still mentions the 15,000 points cap, but it seems safe to say that this will be corrected ASAP and that heavy stayers can continue to book IHG hotels knowing that they will receive a bonus. British Airways has released more than 50,000 extra Avios seats in Club World! between London Gatwick and Fort Lauderdale, Tampa, Orlando Las Vegas, San Jose (Costa Rica), New York JFK and Mauritius and between London Heathrow and Abuja, Accra, Amman, Atlanta, Austin, Bahrain, Baltimore, Bangalore, Beijing, Beirut, Boston, Buenos Aires, Cairo, Calgary, Cape Town, Chicago, Dallas, Denver, Dubai, Durban, Houston, Jeddah, Johannesburg, Kuala Lumpur, Kuwait, Lagos, Las Vegas, Los Angeles, Mexico City, Miami, Montreal, Moscow, Nairobi, Nashville, New Orleans, New York JFK, New York EWR, Philadelphia, Phoenix, Rio de Janeiro, Riyadh, San Diego, San Francisco, San Jose, CA, Santiago, Sao Paulo, Seattle, Seoul, Seychelles, Shanghai, Singapore, Tel Aviv, Tokyo NRT, Toronto, Vancouver and Washington. Why did this need to be posted in multiple threads? 2 Bits articles today so need to make sure everyone can see it. Do you know why there are 2 Bits threads? Because we were going to run the article on this promo this morning but BA stopped us so I had to fill a gap at short notice. Amusingly I am still banned from writing about it until BA gives permission even though the press release has gone out. This was the agreement we made in order to get advance notice of the deal. @Rob Epic fail by BA PR!! Ha, I also searched for Cape Town and came up nothing. Availability to JNB and DUR does seem better though. Rare chance to get non-355 seats there. OT: Morrisons Christmas vouchers – 11,250 More points for £150 spend in each of the next 4 weeks. Terms say excludes purchase of gift cards. Has there been any evidence to the contrary, e.g. in previous years? Gift Cards definitely won’t work – they can see what you are buying (unlike the CC companies), so it is easy for them to exclude them. Ok, thanks. Will likely bin these then, have much better inducements from their competition! I asked Amex this when I had the offer, and phone bookings won’t trigger. The offer is for online bookings. Unless the terms have changed this time around? Curve community has a posting saying beta testing of Amex acceptance will begin on 20 November and has a BA card in the example. Is the community/testing open to those who are lucky to be invited or public? It says there will be a link in the Curve community on 20/11. I got my invite to the community today, hadn’t heard of it before. Same here. Invited today and signed up to stuff. Their roadmap is public i think via the trello link. O/T stressing about MCOL (Money Collection Online) when BA fails to give EC261 compo. I’m not surprised people stress about this. I’ve never had to do it but yesterday I got the welcome news that Amazon Guarantee had forced a seller to refund me £20 for something not delivered, after pursuing the case for over 2 months. Basically I ordered 2 but the seller only sent me 1. They’d paid postage for the weight of 2 items (so they said) but only 1 got packed & sent to me. My case got rejected twice before I won it on my second appeal. Anyway, I was on the point of going down the MCOL route – but it was a bit stressful thinking of all the hassle etc & all for £20. I got to the MCOL registration stage and that was bad enough. You start thinking: is it even worth it? & you can’t bill for your time. Anyway, I quite understand if people get stressed up at having to issue a MCOL claim against BA to get their rightful compo. If you fall into that camp, remember Bott & Co will take on your case if it has legs and do everything for you, I think their cut of the compo is about 30%. Sometimes I don’t care about the money, it’s the principle. Depends how hard done to I feel. Raffles – HfP promoted the IB 90K deal. I think you need to remind people about the 1st December deadline, it’s only a couple of weeks away. Maybe in comments. 1% of HfP users who comment? 1-These Avios cannot be transferred or combined with Avios from other programmes or accounts, and they will expire on December 1st 2018 if not used by that date. All Avios from this promotion not redeemed by then will be withdrawn from the customer’s account on December 1st 2018. Ok ok. At the time I was happy with my decision, spent £200 on IHG promos instead and tripled it with 3 nights IC redemption. At the time it was a better option than doubling it on hotels with IB+ which was most peoples game plan. Of course I could have done both but didn’t. If you are looking for an admission of regret or failure, yes I admit it now, a little bit, given the way it worked out so there you have it 🙂 However, cash required in addition to avios for my zone 7 redemptions is now such that I need to rethink my whole strategy, even with a 241 exINV in CW I am no longer managing 1ppa value. I can’t see how it is possible to complete the “Double Your Stay” challenge on the IHG Q3/Q4 Accelerate to get the bonus for completing all the challenges. Do I just have to wait for time to go by? Or do I have to actually earn the 15,000 bonus points that was the original maximum (I am almost there but would prefer to direct my remaining stays this year to Hilton)? Do you have a ‘complete x of y targets for bonus’ type of challenge? I don’t, just 4 independent ones so nothing depends on how many double points I earn.